Whether you choose to believe it or not, the colours we choose to have in our homes can affect our moods. You may not have realised, but sometimes the colour on the walls of the rooms you are in can affect how you feel. For this reason it is important to choose the colour scheme for your home carefully, including the kitchen. 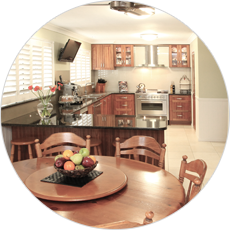 The kitchen is one of the rooms in your home you will spend a decent amount of time in. Which is why it will be important that you feel good when you’re in the area. 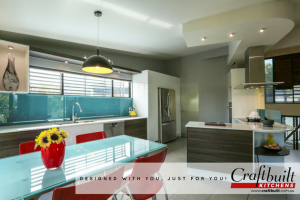 Naturally, getting your kitchen made by the kitchen design experts at Craftbuilt Kitchens will ensure that it feels like a wonderful room to be in. You can also think carefully about the colours you choose, how these will make you feel and how they fit in with the rest of your home. If you are working with a small kitchen area then you will need to make some wise decisions that will help make the area feel more open. The way you use your storage space, for example, is important but the colours you choose will also have an effect. Choosing dark colours will make the area appear even smaller than it is, whereas light colours will give the impression that the kitchen area is bigger, more open and airy. If you do want bold colours in your kitchen it’s a good idea to remember that you may want to eventually change these. For this reason it’s recommended that the bold colours are done on something that is more affordable to change such as paint on a feature wall. Having the more costly items such as bench tops in neutral colours means these will not clash with a bold colour but then in the event you become tired of the bold feature wall or accents in the kitchen then changing the paint won’t cost as much as changing the bench top or cupboard doors. A splash of yellow is a great way to make a kitchen feel more sunny and welcoming. A pale yellow in a small kitchen area can also help give a brighter more open effect. Red is very stylish in kitchens and can be an appetite stimulant. For a rich and warm effect add small amounts of red; too much will be overbearing. Green adds a nice fresh and airy feel; again, don’t go over the top. A single colour scheme has a lot going for it. It gives your kitchen a clean and simple look and if you are not very interior design savvy you don’t have to worry about choosing colours that clash. This style is also suited to those who don’t like their kitchens to look very bold and prefer a subdued look. If you wish to create a slight ‘accent’ you could use the same colour in some areas in a different shade. Using neutral colours such as grey, tan and cream you can create a very classy look to your kitchen. If you are looking for something a little more modern and edgy then you can look at mixing a couple of colours together. This style really adds a lot of life to your kitchen however use caution with bright colours as this can be a little overwhelming on the visual senses and may even be stressful to the occupant. Always go for the options that are less visually confronting. If you are a really creative type then you may want to add lots of bold colours to your kitchen, especially if that goes with the theme of the rest of your home. 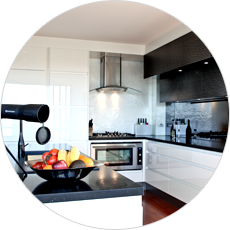 When visiting kitchen showrooms to choose your kitchen colour scheme there are a few things to remember. For a feeling of great space use neutral, cool and light colours. Using whites and creams will also give a feeling of cleanliness. Unless you have a fairly large kitchen it’s best to steer away from dark colours as these can make a room seem smaller. Consider the lighting you will use and also the natural light that comes into your kitchen. Each of these will affect how the colours are seen. Natural light gives an accurate rendition however artificial lighting can give an inaccurate one. Your kitchen designer can discuss with you the fantastic colours available and what might suit your home. The possibilities are endless and the choice is yours. Perhaps you have lived in your present home for many years, moving in as a newly married couple, having children, getting them through years of education then into the workforce, and finally seeing them move out to start lives of their own. You have reached a stage in life where you now have some ready cash to use in doing some renovating that you have put off until you have had the time and opportunity to do it. Fresh paint with perhaps a new colour scheme, new drapes and lounge to go with it, and a lovely new dream kitchen designed to your own specifications. Before you choose your wall colours it is an idea to get an idea of what it looks like with a virtual home computer software program. This allows you to put in your floor plan and then put colours into the plan for walls and ceilings and door/window surrounds. Once you are satisfied with colours for the walls of the home you can see how well your chosen kitchen colours co-ordinate with them. 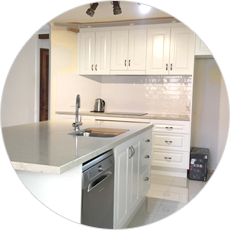 When you are completely happy with your choices contact a firm that is in the business of making kitchens in Brisbane and discuss your ideas with them. 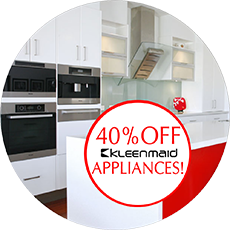 Your kitchen will be measured up to ensure your kitchen design in Brisbane will be a perfect fit before it is made and installed, with your chosen colour choices included. Of course, if you don’t intend to stay on in the home for long after you do all these upgrades, and are thinking of putting it on the market for sale, you might have to rethink your choice of colours. You may absolutely love it, but someone who looks at it as a potential buyer may have completely different preferences. If you have bold colours that dazzle and the potential buyer is a person who favours soft pastels they may walk away. When you are intending to sell up a home, in order to maximise your chances of a quick sale, always keep colours to soft neutral tones. Neutral backgrounds allow for contrasting colours that are soft pastels or bold bright colours, giving prospective buyers an opportunity to stamp their own personality on the home with their personal colour choices. Although there seems to be a trend to splash bold colour around in the home lately, not everyone is in favour of it. If colour is kept to neutral tones it will attract all comers as they can easily make their own colour contrasts. 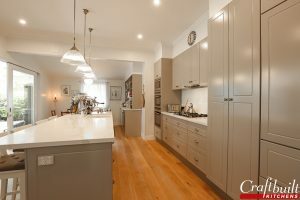 A chat with the highly capable designers at Craftbuilt Kitchens will soon have you on the way to a perfectly matched colour scheme and stunning kitchen. Give them a call today at 07 3341 9166.